Information: Louis Harvy Chalif, teacher and author of books about dance. Louis was born in 1876, and was a renowned Russian ballet dancer. He began studying ballet at the age of nine in Odessa, Russia. He studied at the Government Theatre under Thomas L. Njinski, the father of the great artist, Vaslav. He traveled as a dancer with the Imperial Moscow Ballet, under the supervision of Lidia M. Gerten, the prima ballerina of the day. Louis later traveled through Europe and became ballet master of the Odessa Government Theatre. Louis immigrated to New York City in 1904. He was appointed director of physical training in the public schools of New York City, New York. In 1905, Louis taught a class at the annual convention of the American Society of Teachers of Dancing. In 1905, he also opened the Louis H. Chalif Normal School of Dancing (also called the Chalif Normal School of Dancing) in New York at 5-9 W. 42nd St. He instructed teachers of dance, "physical culture," and recreation, as well as aspiring professional dancers and children. The Chalif School was one of the earliest schools in the United States to instruct teachers in dance. He became known as "the dean of New York dance teachers" and "the first Russian ballet master to teach in America." In 1905-06, he danced with the Metropolitan Opera Ballet and was assistant ballet master under Luigi Albertieri. In 1907, he moved his school to 7 W. 42nd St. In 1908, Louis was hired to teach folk dances at the Second Annual Convention of the Congress of the Playground Association of America. Louis taught folk dancing at the School of the Ethical Culture Society in New York, founded by Felix Adler. 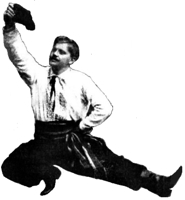 In 1909, he also taught "athletic dancing" at YMCAs and became the Director of the Historical, Pantomime, National, and Folk Dances of the Hudson-Fulton Celebration in New York. He was director of dance at the Hudson-Fulton Celebration in 1909. After 1910, Louis stopped performing and focused entirely on teaching dance. He was president of the American Society of Teachers of Dancing. From 1910 to 1918, he was instructor to the American Society of Professors of Dancing. Louis was a founder of the Dance Art League of America. In 1913-1914, his school was relocated to a building commissioned by Louis, the Temple to Terpsichore on W. 57th St., across the street from Carnegie Hall. In 1916, the Louis H. Chalif Normal School of Russian Dancing building was built to the design of architects George A. and Henry Boem. Louis boasted in 1921 that "altogether the [Chalif School] building is unparalleled for its purposes in America, and a striking evidence of the success which this school has met with through giving the best instruction." Louis always loved the building and even after it passed into other hands he never missed an opportunity to walk by just to look at it. He was active as a teacher in settlement houses in New York City, such as the Henry Street Settlement. Louis gave workshops throughout the country, teaching various types of dancing and organizing folk festivals for colleges, playgrounds, schools, YMCAs, etc. In 1933, Louis moved out of the Normal School building. By 1937, Louis was teaching at the International Building at Rockefeller Center, 630 5th Ave. He authored many works, five of which have been translated into several foreign languages. He arranged some 1,200 dances which were compiled according to their level of difficulty within the categories of Aesthetic, Ballet, Ballroom, Character, Folk, Historical, National, and Pantomime. He opposed modern dance and was a member of a number of Jewish organizations and of Temple Rodeph Sholom. "Dance Magazine" in 1945 credited him with popularizing "bar work, toe work, [and] classical music in the dancing school" and placed him "at the forefront of the movement that introduced ballet instruction to the average American child," and that adapted and simplified Russian ballet technique that could be employed in physical education instruction. Through his educational efforts, particularly at the Louis H. Chalif Normal School of Dancing, Louis Chalif was influential in the promotion of dance in New York City and the United States. Louis Harvey Chalif died in 1948. Allegretto: Esthetic Solo or Group Dance. By Louis Harvy Chalif, New York: Chalif Normal School of Dancing, 3 pp., 1914. Autumn: An Interpretive Solo Dance. By Louis Harvy Chalif, New York: Chalif Normal School of Dancing, 9 pp., 1914. Bavarian Folk Dance. By Louis Harvy Chalif, New York: Chalif Normal School of Dancing, 3 pp., 1914. Blue Danube Waltz: Greek Solo or Group Dance, The. By Louis Harvy Chalif, New York: Chalif Normal School of Dancing, 5 pp., 1914. Bride's Dance: A Russian Pantomimic Solo Dance, The. By Louis Harvy Chalif, New York: Chalif Normal School of Dancing, 7 pp., 1914. Bulgarian Folk Dance. By Louis Harvy Chalif, New York: Chalif Normal School of Dancing, 3 pp., 1914. Chacone: French Duet Dance. By Louis Harvy Chalif, New York: Chalif Normal School of Dancing, 7 pp., 1914. Chalif Text Book of Dancing: The Fundamental Positions and Exercises, The. Volume I, By Louis Harvy Chalif, New York: Chalif Normal School of Dancing, 1914. Chalif Text book of Dancing: Greek Dancing, The, Volume III.By Louis Harvy Chalif, New York: Chalif Normal School of Dancing, 1920. Chalif Text Book of Dancing: Fundamental Positions and Exercises, The, Volume IV. By Louis Harvy Chalif, New York: Chalif Normal School of Dancing, 3 pp., 1914. Chalif Text Book of Dancing: Further exercises, port de bras, and ..., The, Book I. by Louis Harvy Chalif, New York: Chalif Normal School of Dancing, 1914. Cymbal Dance: Greek Solo, By Louis Harvy Chalif, New York: Chalif Normal School of Dancing, 8 pp., 1914. Csárdás: Hungarian Peasant Duet. By Louis Harvy Chalif, New York: Chalif Normal School of Dancing, 9 pp., 1914. Dances by Louis H. Chalif: Classical Music, Carefully Chosen and .... By Louis Harvy Chalif, New York: Chalif Normal School of Dancing, 1916. Dances; National, Demicharacter, Ballet, Estethetic, Interpretive .... By Louis Harvy Chalif, New York: Chalif Normal School of Dancing, 1915. Exercises for Dancing from Chalif's Text Book of Dancing: Volume 1. By Louis Harvy Chalif, New York: Chalif Normal School of Dancing, 53 pp., 1914. Feria: Spanish Solo Dance, La. By Louis Harvy Chalif, New York: Chalif Normal School of Dancing, 3 pp., 1916. Fireflies: A Simple Esthetic Solo Dance. By Louis Harvy Chalif, New York: Chalif Normal School of Dancing, 5 pp., 1914. Folk Dances of Different Nations, 3 Volumes. by Louis Harvy Chalif, New York: 1914 (1926). French Doll: Characteristic Solo Dance, The. By Louis Harvy Chalif, New York: Chalif Normal School of Dancing, 7 pp., 1915. Furlana: Venetian Gondolier Solo, Usable for a Group .... By Louis Harvy Chalif, New York: Chalif Normal School of Dancing, 6 pp., 1914. Galanterie: Simple Couple Schottische Series, For Circular Formation. By Louis Harvy Chalif, New York: Chalif Normal School of Dancing, 8 pp., 1915. Góralski Tanieć: A Polish Dance. By Louis Harvy Chalif, New York: Chalif Normal School of Dancing, 5 pp., 1914. Hussar: Hungarian Characteristic Dance, The. By Louis Harvy Chalif, New York: Chalif Normal School of Dancing, 5 pp., 1915. Jean et Jeanette: French Character Pantomimic Duet Dance. By Louis Harvy Chalif, New York: Chalif Normal School of Dancing, 5 pp., 1914. Joy of the Rose: Pierrot Pantomime Solo Dance. By Louis Harvy Chalif, New York: Chalif Normal School of Dancing, 5 pp., 1915. Light and Darkness: (Aether and Erebus) Greek Pantomime Duet Dance. By Louis Harvy Chalif, New York: Chalif Normal School of Dancing, 8 pp., 1914. Maid of Honor: Polish Solo Dance, Rather Difficult. By Louis Harvy Chalif, New York: Chalif Normal School of Dancing, 11 pp., 1909. Moment Musical: Interpretive Solo Dance. By Louis Harvy Chalif, New York: Chalif Normal School of Dancing, 5 pp., 1914. New Dances. By Louis Harvy Chalif, New York: Chalif Normal School of Dancing, 1929. New Music for the Classical Exercises for Technique in Dancing. By Louis Harvy Chalif, New York: Chalif Normal School of Dancing, 42 pp., 1914. Nightingale: A Very Simple Esthetic Solo Dance, The. By Louis Harvy Chalif, New York: Chalif Normal School of Dancing, 5 pp., 1914. Paloma: Mexican Dance, La. By Louis Harvy Chalif, New York: Chalif Normal School of Dancing, 5 pp., 1917. Pavanne: An Old French Duet Dance .... By Louis Harvy Chalif, New York: Chalif Normal School of Dancing, 7 pp., 1914. Petite Coquette: Esthetic Dance. By Louis Harvy Chalif, New York: Chalif Normal School of Dancing, 3 pp., 1914. Pied Piper, The. By Louis Harvy Chalif, New York: Chalif Normal School of Dancing, 3 pp., 1914. Polka Miniature: A simple Aesthetic Solo Dance. By Louis Harvy Chalif, New York: Chalif Normal School of Dancing, 7 pp., 1914. Pragska Polka: Czech-Slovak Duet, Rather Difficult. By Louis Harvy Chalif, New York: Chalif Normal School of Dancing, 4 pp., 1920. Psyche: An Interpretive Solo Dance. By Louis Harvy Chalif, New York: Chalif Normal School of Dancing, 9 pp., 1914. Russian Festivals and Costumes for Pageant and Dance. By Louis Harvy Chalif, New York: Chalif Normal School of Dancing, 176 pp., 1921. Song of the Robin: Interpretive Solo or Group Dance, The. By Louis Harvy Chalif, New York: Chalif Normal School of Dancing, 5 pp., 1914. Studies in Rhythm and Expression: Booklet 1 Containing Series 1 and 2. By Louis Harvy Chalif, New York: Chalif Normal School of Dancing, 40 pp., 1925. Sunbeams: Simple Couple Polka Series, For Circular Formation. By Louis Harvy Chalif, New York: Chalif Normal School of Dancing, 5 pp., 1915. Tourdion: An Old French Folk Dance. By Louis Harvy Chalif, New York: Chalif Normal School of Dancing, 3 pp., 1914. Wooden Shoes: Dutch Folk Dance. By Louis Harvy Chalif, New York: Chalif Normal School of Dancing, 5 pp., 1914.